On Wednesday, prior to going to the Individual & Ensemble event in downtown Madison, I had to pay a visit to an area shopping mall outside of downtown. While there, I met Colleen and Rex Hoyt from Hillsboro, Ore. They informed me that their daughter Kirbie, a second-year member of Santa Clara Vanguard's mellophone section, had no idea they were in town. They knew Kirbie would be hanging around the Overture Center for the Performing Arts when fellow SCV members were performing in competition, but they didn't know how they would run into her and they wanted it to be a surprise for her. When we all got to the I&E venue, her parents gave me her cell phone number and I called her with a somewhat deceptive explanation that the SCV staff had given me her name and number, stating that she would be someone good to talk to for a DCI.org article. 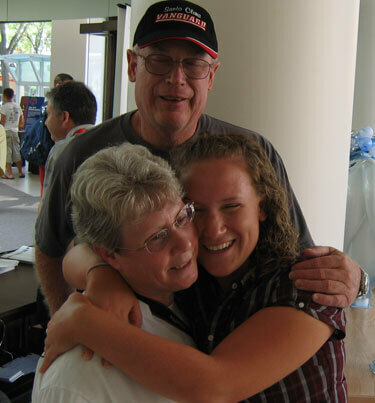 SCV member Kirbie Hoyt enjoys a surprise visit from her parents on Wednesday in Madison. She couldn't understand why she was picked, but she agreed to walk the two blocks to the Overture Center to be interviewed. I instructed her that I was right inside the front door at a table with my computer, where I was interviewing others for an article about reactions to the I&E event. Colleen and Rex hid behind a large column in the lobby and informed me when they saw Kirbie outside the large lobby windows. I waited for her to find me and then stated I needed to take her photo, asking her to stand just to the side of the column. I then stood next to her parents and asked her to turn towards me. Her reaction upon seeing her parents was precious. According to Kirbie, "I was sitting at Quiznos with a friend and the call seemed so random. I wasn't expecting my parents. Mom just called me last night and never indicated they were here in Madison. It's a nice surprise for finals week. The past two days, other members' parents were beginning to show up and I've been getting homesick the past two weeks." Rex stated, "We've been excited for the last three weeks, ever since we decided we were going to do this. Everyone we talked to was sworn to secrecy. We ran into some of her friends before we got to I&E and they all agreed not to tell her we were here. I umpire softball games during the summer and I took some of that money for this trip." Colleen said, "It was priceless to see her reaction. It's also incredible to watch your child use the talent they've been given, develop it and work so hard to go out on that field for a just few minutes." Kirbie, when asked what she would be doing with her parents next, declared, "We'll probably end up going to the mall." I asked, "So they can buy you stuff?" She replied, "Probably. Actually, I do need a new iPod charger."